This trip has been the chance of a lifetime. To travel to a whole new country, mingling with the locals and immersing yourself in a new culture - it's a real eye-opener to just whole big the world truly is. I can only hope that, in the near or distant future, I can return to Japan, and I encourage others to do the same. This trip was the best thing to ever happen to me. I was able to meet so many people who changed my life for the better. I was also able to see places I never thought I'd get to see. Of course, this is not the end of the journey, but the beginning. 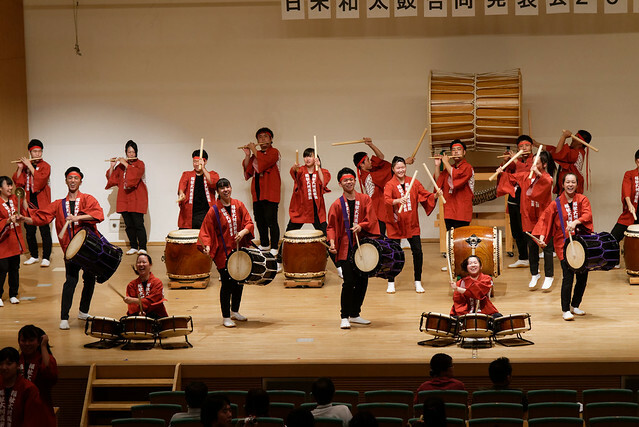 Many of the students have expressed interested in continuing to play taiko as members of Pittsburgh Taiko, so there'll be plenty of opportunities to see them perform. 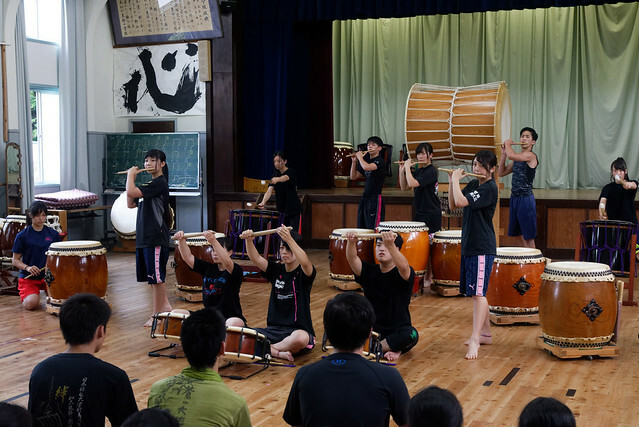 (Regular updates are posted to both the Pittsburgh Taiko website and the group's Facebook page, so be sure to check them out! 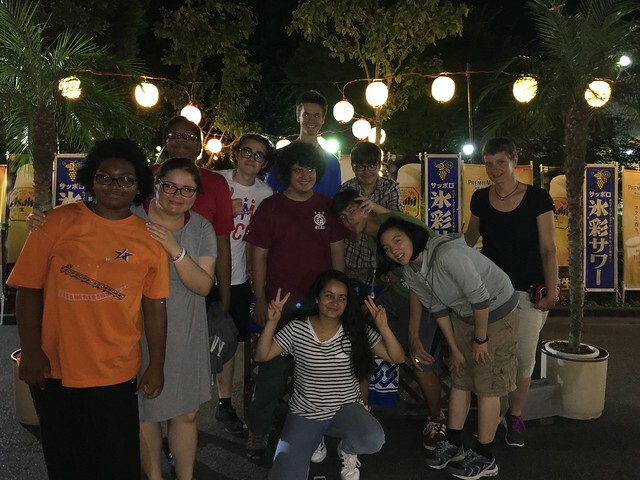 Meanwhile, the major topic of conversation amongst the students while traveling back to Pittsburgh was how they could get BACK to Japan - whether via study abroad, enrolling in a university there, work, or many other means. 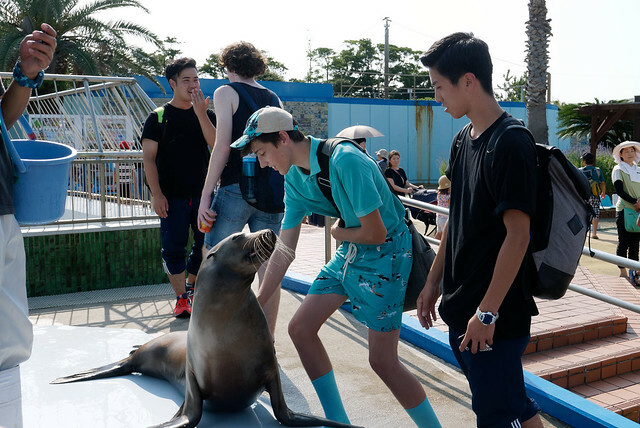 So, we expect to see them make many return trips to Japan, further strengthening the relationships they established with the students at Nihon Fukushi University Affiliated High School. 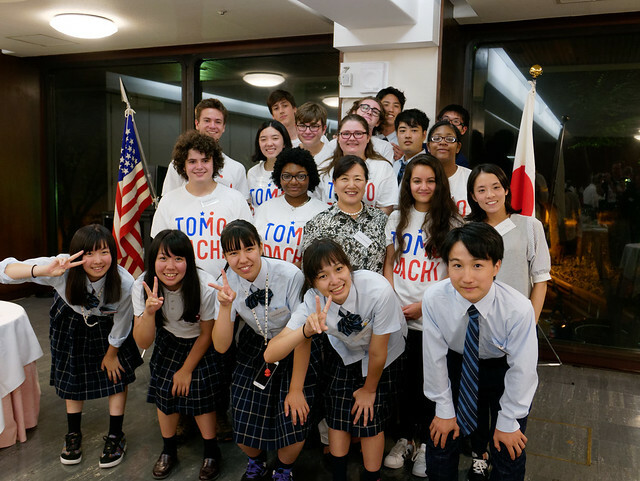 Thanks for reading the blog, and for your support of the Japan-America Society of Pennsylvania, the TOMODACHI initiative, and the students' participation in the Ties Through Taiko program! 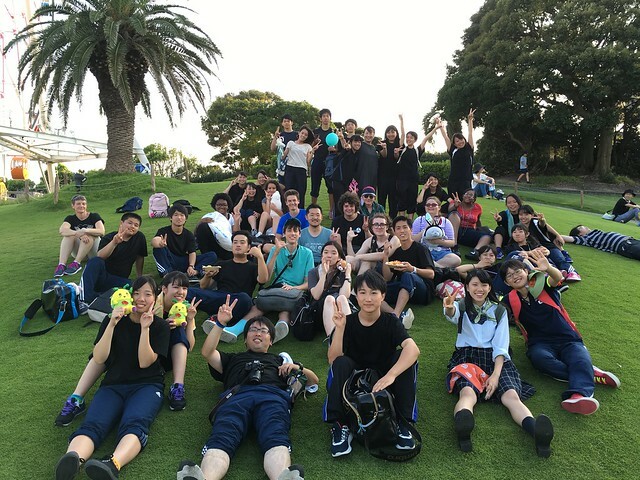 The Nihon Fukushi University Affiliated High School has a blog through which they provide updates for all their various activities. 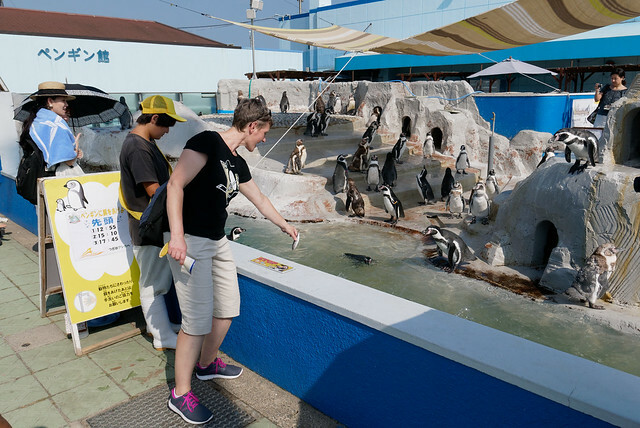 This includes regular updates for the wadaiko club "Rakko," our hosts while in Mihama. Even as I was writing updates for this blog, they were posting daily on theirs! The contents are in Japanese, so if you're able to read Japanese the blog provides a great alternate perspective on the trip. Unfortunately, I won't be translating these, but even if you don't read Japanese there are some great pictures that compliment what I took on the trip! I've listed all posts below for easy access. However, you can navigate yourself from the first post if you'd like. Each post is numbered (1-18), and at the bottom of each post is a navigation bar with "next post" and "previous post" written in English. 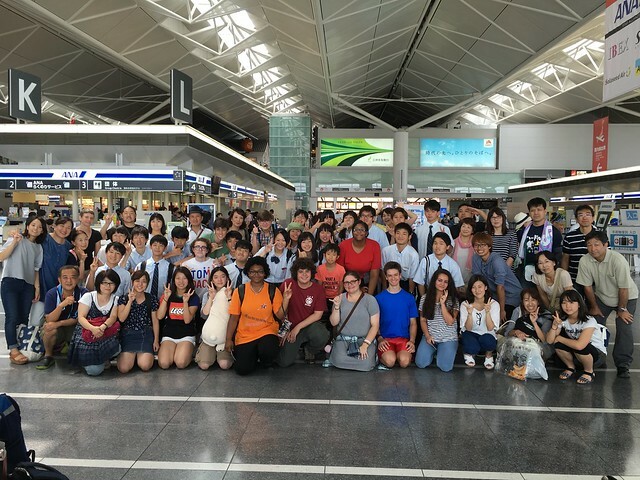 The Pittsburgh students have come to Japan! 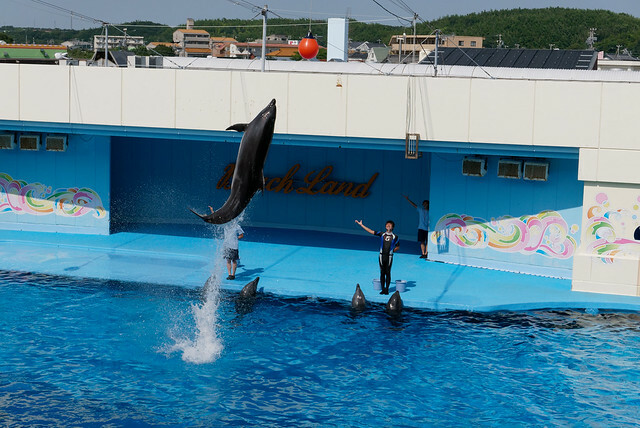 Visit the Mihama mayor's office! Performing at Uotaro! 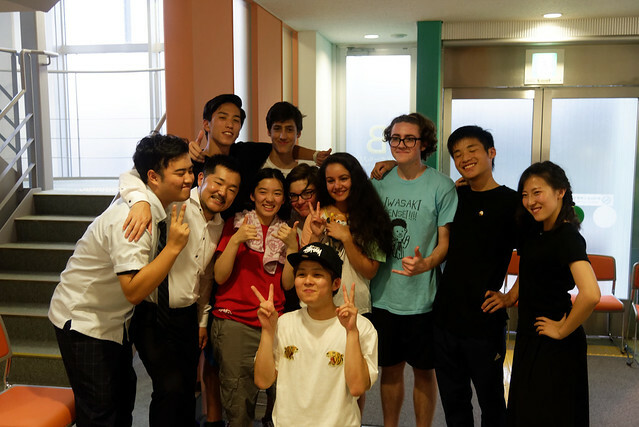 While in Japan, the students gave two public performances, and the videos from these performances are now available for viewing on Youtube! 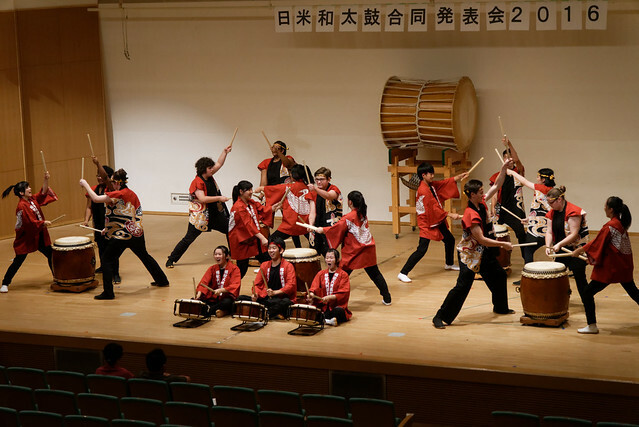 The next public performance was the final performance of the trip, the joint performance between Rakko, Tokoraku, and the Pittsburgh Taiko TOMODACHI team. Audience members were encouraged to leave comments via a paper included with the program. 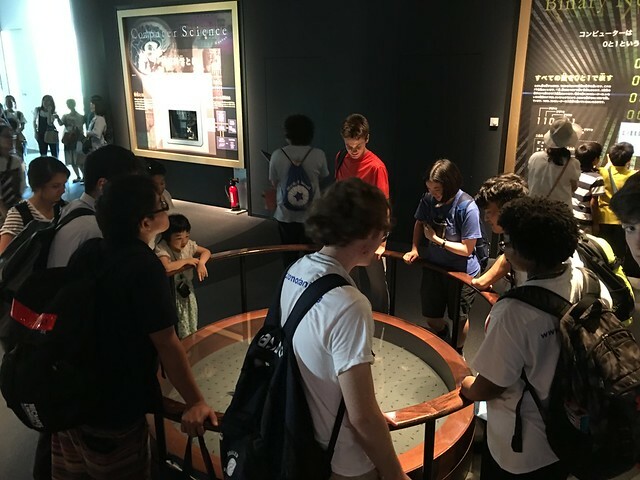 Many mentioned that they didn't know what to expect from the American group, but were both pleasantly surprised and impressed by the students, thoroughly enjoying their performance. Well, it took a bit longer than expected, but we’re home! 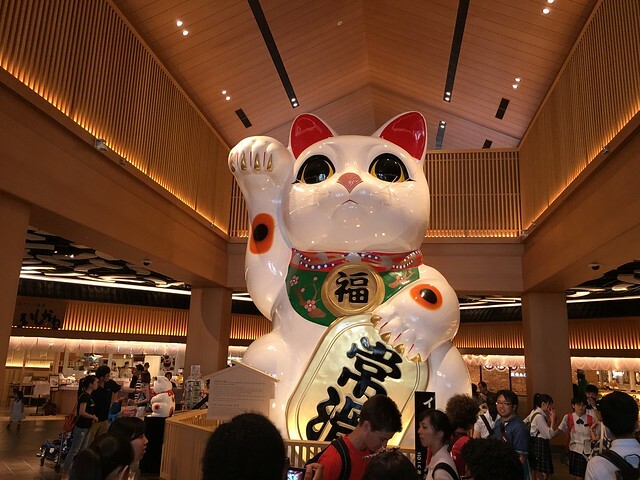 After an unexpected night’s stay at the Narita Tobu Hotel Airport (with accompanying dinner and breakfast), we returned to Narita for our new flights. ANA rebooked our flights, so we would now be flying from Narita to Houston, and then from Houston to Pittsburgh. 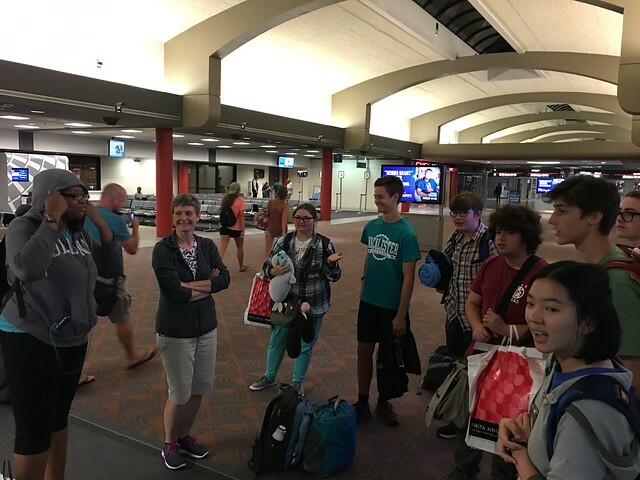 While long, there were no problems on our international flight, and we safely got through customs at Houston and boarded the flight to Pittsburgh. Once back in Pittsburgh, everyone was greeted by their families, and after 11 days together we finally went our separate ways. Just because the trip is over does not mean this blog is done, however. Please look forward to a few more posts about the trip! Everyone spent the morning with their families, before meeting up at Chubu Centrair International Airport with final goodbyes. Continuing from last night, tears were shed on both sides, and it was clear that everyone has created some deep friendships. 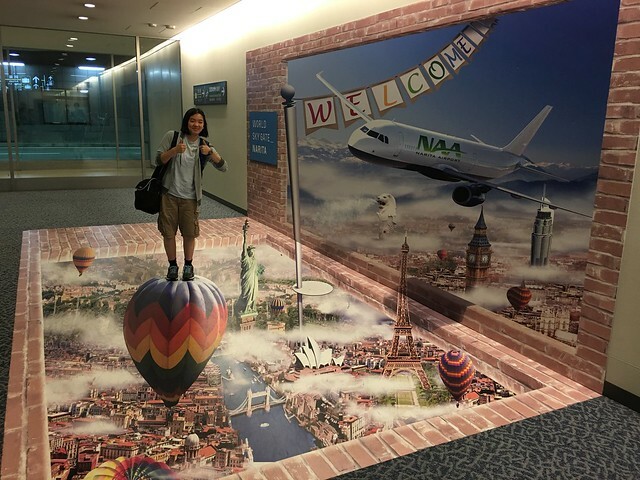 The adventure was not over, however, for after our plane left Chubu for Narita airport, we found ourselves in the air for much longer than expected. Due to troubles at Narita, our plane was diverted to Haneda International Airport, where we waited for a period before continuing our journey to Narita. 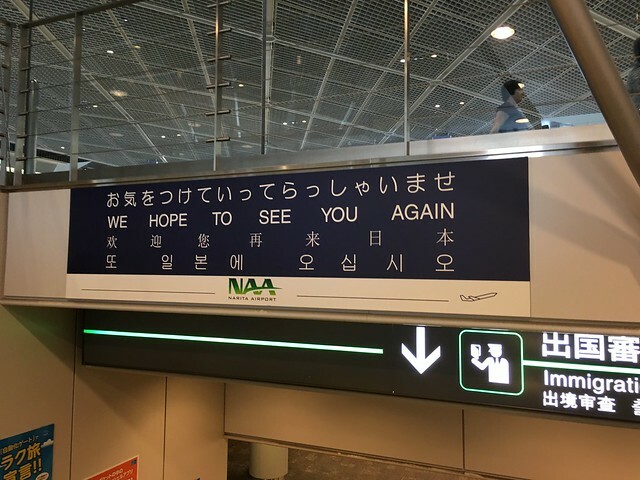 However, when we arrived at Narita, it was too late to catch our plane to Chicago. So, after collecting our luggage, we made our way to a hotel, where our stay was arranged by ANA (All Nippon Airways, our carrier from Chubu to Narita). The airline kindly arranged for not only our rooms for the evening, but also dinner and breakfast during our stay. While the students were wishing that they didn’t have to go back to the US today, I’m sure that this isn’t what they had in mind. 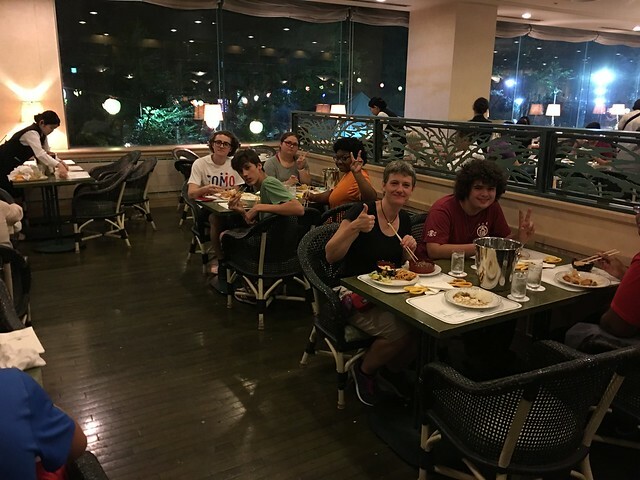 Nevertheless, we’ll enjoy one more night in Japan, relaxing at the hotel and preparing for a day of travel tomorrow. More pictures from the day can be found at today's Flickr album. 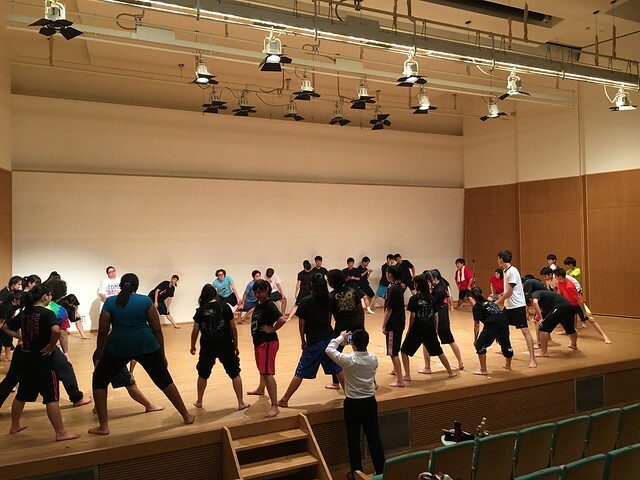 After a week of intense practices, it was finally time to show the Mihama community what everyone had learned since beginning joint practices on Monday! 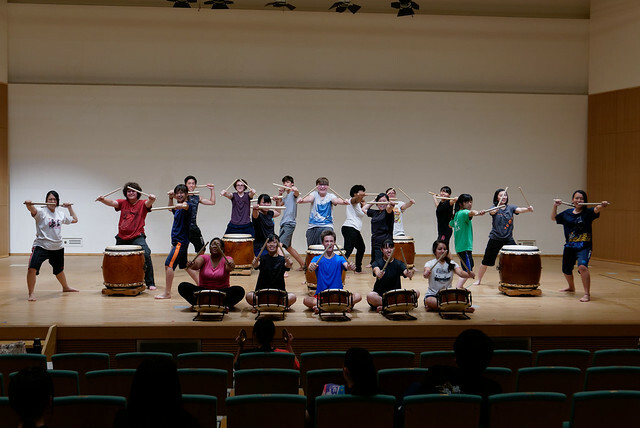 The day began with the standard warmups, followed by a performance by Rakko of their piece “Hana Matsuri,” and then brief run-throughs of the two joint pieces to be performed in the afternoon, “Omatsuri Daiko” and “Raku.” By now the students were comfortable with not only the pieces but with each other as well, and the bonds they had established over the last week showed on stage. The rest of the morning was filled with staging checks, making sure that everyone knew what drums went where for what piece, and what do to before/after each piece. After lunch and some final preparations, it was time for the performance! 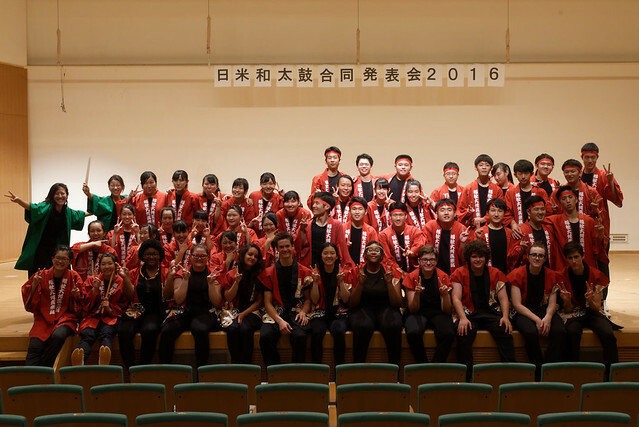 Officially titled the “Japan-America Wadaiko Joint Recital 2016,” the afternoon concert featured performances by Rakko, the Pittsburgh students, and the local taiko group Tokoraku, a community group who counts among their members several former members of Rakko (including one who came to Pittsburgh last year!). 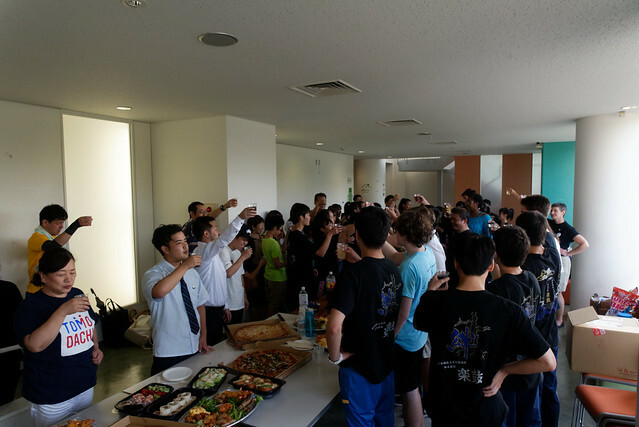 In the cross-cultural spirit of the program, group introductions and song introductions were done in both English and Japanese. 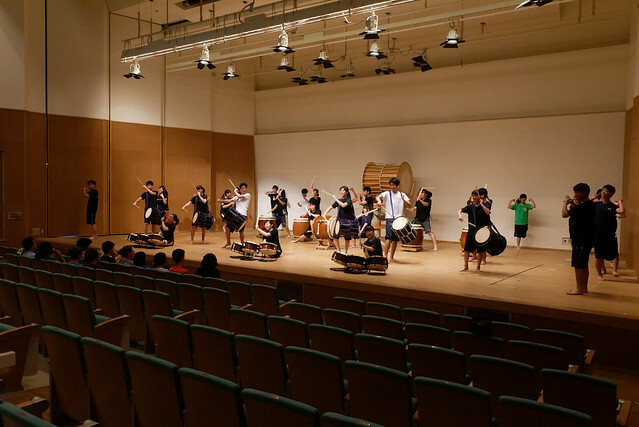 The concert opened with a performance by Rakko of “Kairei,” the piece that won them 3rd place at the All Japan competition several weeks ago. Tokoraku then took the stage for two pieces, “Hito” and “Minakuchi-bayashi,” before Rakko and Tokoraku joined together for an arrangement of Chichibu yatai-bayashi. 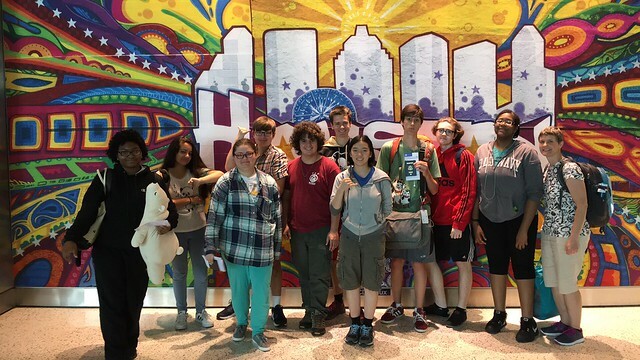 The group was warmly received by the audience, many of whom expressed after the concert in written comments that they were surprised and pleased by the performance level demonstrated by the Pittsburgh students. 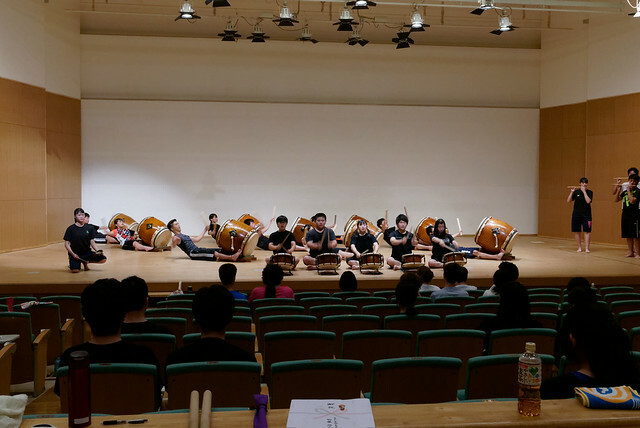 It was evident that they left a deep impression on the audience, most of whom had never seen non-Japanese play taiko before and did not know what to expect. 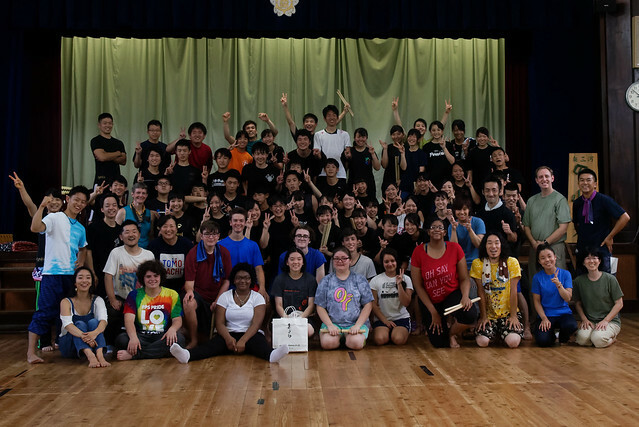 The Pittsburgh students not only represented their schools and Pittsburgh well, but also the greater North American taiko community. 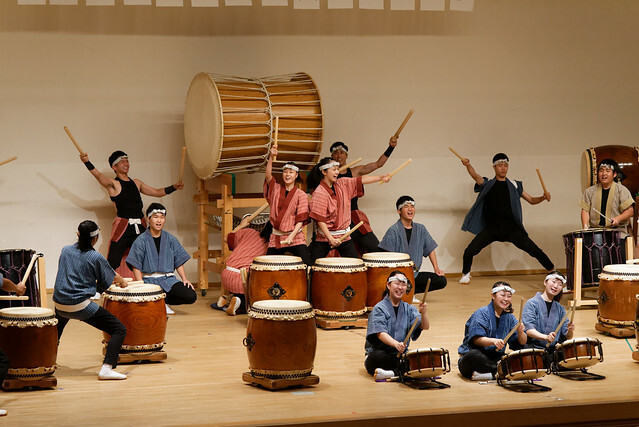 Another short break followed, before Rakko returned to the stage for “Irodori.” It was then time for the moment to which the whole week had been leading up to, the joint performances, as members of both Rakko and the Pittsburgh team took the stage together. 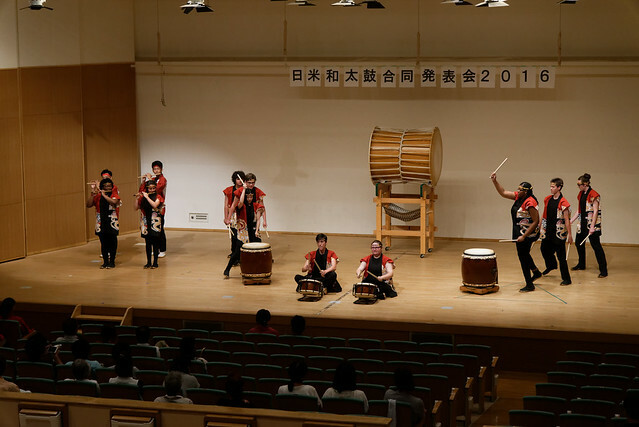 With “Omatsuri Daiko” and “Raku,” the students truly displayed the ties that they had established over the past through week. It was hard to believe that just 5 days prior, they practiced together for the first time. The energy in the hall reached up another level as the students played the two pieces. 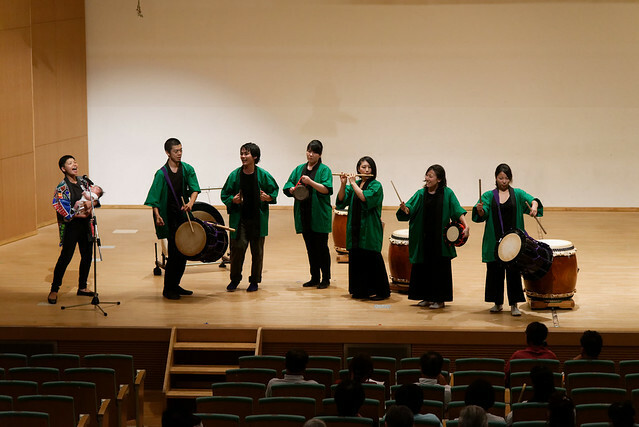 The smile on their faces when they finished playing “Raku” revealed the degree to which they were not only satisfied with their performance, but had enjoyed playing together as well. 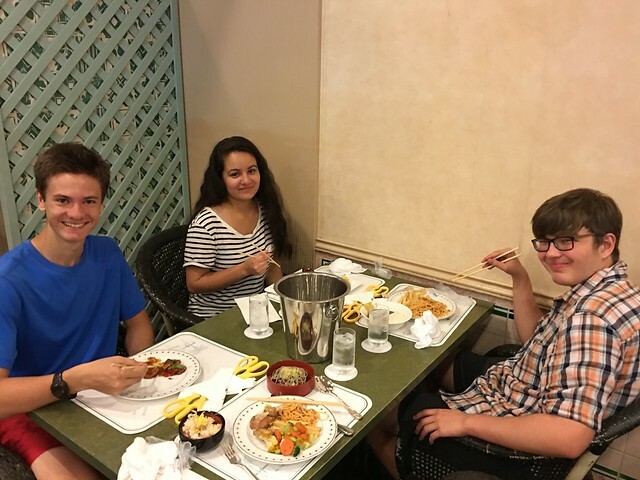 A short break then followed, before Rakko students, Pittsburgh students, and host families got together for a Farewell Party, featuring a rich selection of foods ranging from pizza to sushi. Following the meal, reflections on the past week were shared (in both English and Japanese), and some tears were shed on both sides. It was clear that the ties established over the last week run deep. Even if we must depart for the United States tomorrow, that does not mean that this is an end. Rather, as many stated at the party, this is only a beginning, and we all look forward to seeing what springs from this exchange. Once the party ended, the students departed to spend one last evening with their host families, before a day of travel tomorrow. 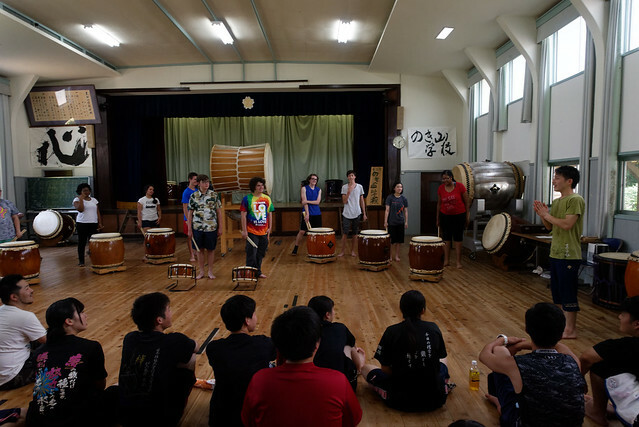 Visit the Pittsburgh Taiko Flickr page for more pictures from not only today, but the entire trip to Japan. 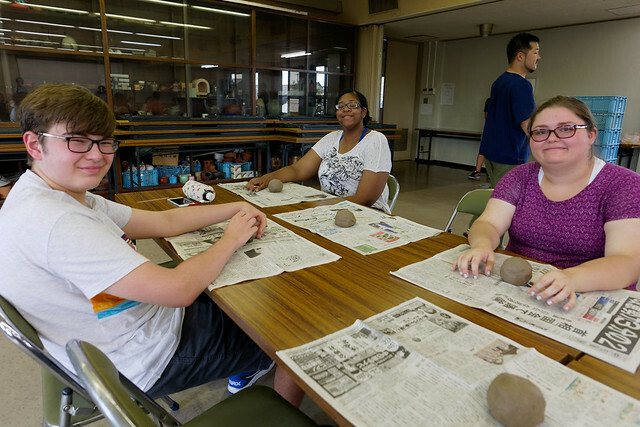 The Nihon Fukushi University Bunka Hall was once again the site of this morning’s activities, as the students continued to polish the pieces they’ll be performing Saturday afternoon. 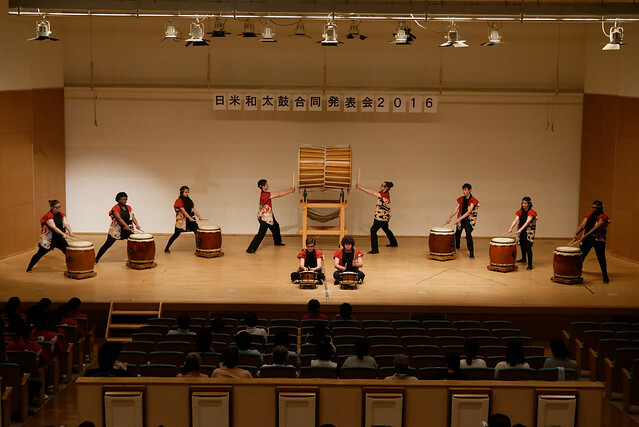 First, the Rakko members presented their arrangement of Chichibu Yatai-bayashi, a regional festival music made famous by the groups Ondekoza and Kodo. 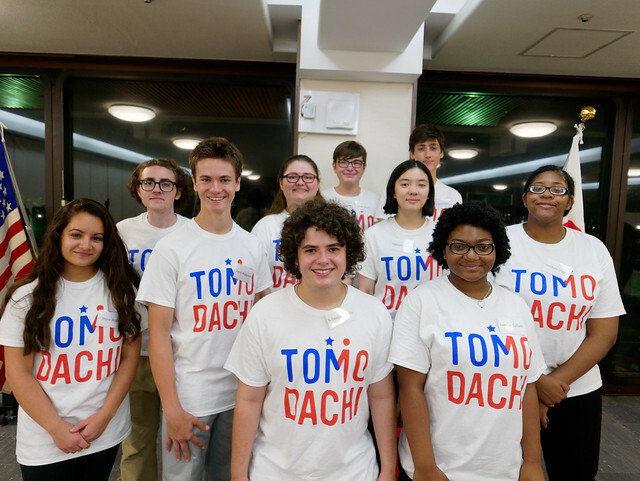 Next, they performed “Raku,” which TOMODACHI participants learned from Rakko members in Pittsburgh last year (and have been working on ever since). After this demonstration, the Pittsburgh students joined the Rakko members on the stage to refine their performance of the piece. With the solid foundation they’ve established over the last year in place, the Pittsburgh students were able to move beyond the rhythms and movements and focus on the subtleties of “Raku.” Alongside the Rakko members, they worked to take their performance to a new level that is enjoyable not just for the audience but also for the performers themselves. 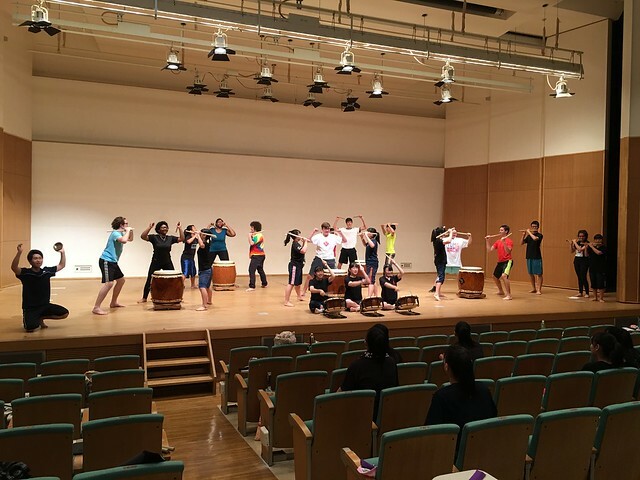 A run-through of “Matsuri Daiko” then followed, to make sure the piece was ready for the groups’ joint performance at the end of tomorrow’s concert. The Pittsburgh students then had some time to work on the three pieces they’ll be performing tomorrow. 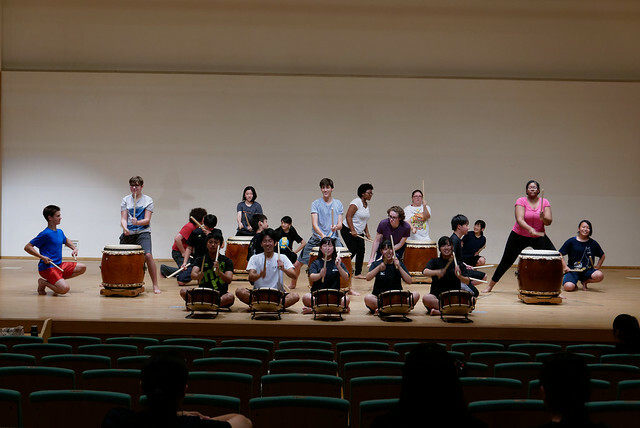 By now, they have grown used to the drums and performance space, and are ready to show tomorrow’s audience what they’ve learned since the TOMODACHI program started last year. 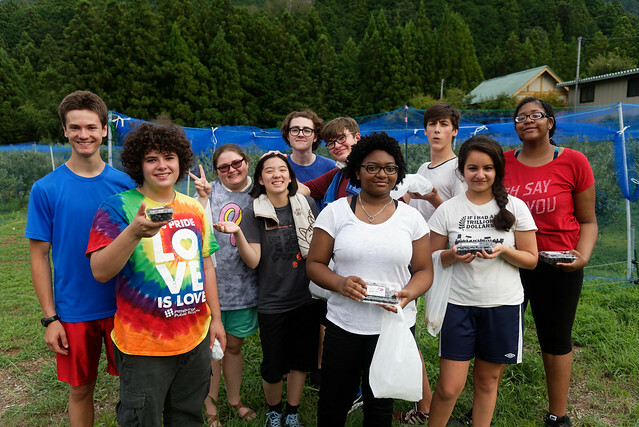 Lunch then followed, with the Pittsburgh students once again eating the bento provided by their host families. 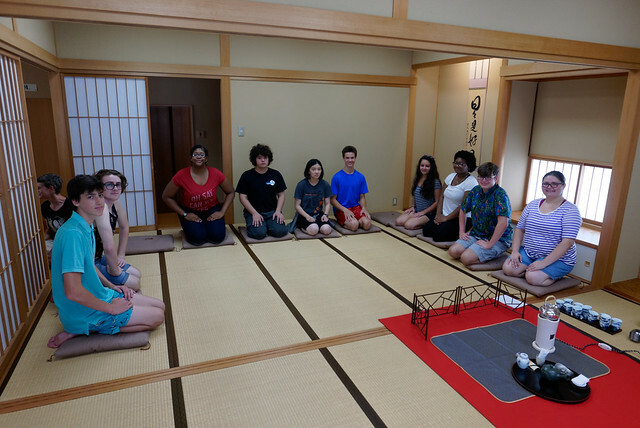 Everyone then traveled to the campus’ Japanese style room - complete with sliding shōji doors and tatami mat floors - to participate in a tea ceremony performed by Iwadachi Fumiyo-sensei, who not only was responsible for coordinating this year’s TOMODACHI trip to Mihama but has regularly traveled to Pittsburgh for a number of years to participate in cultural education programs sponsored by the Japan-America Society of Pennsylvania. 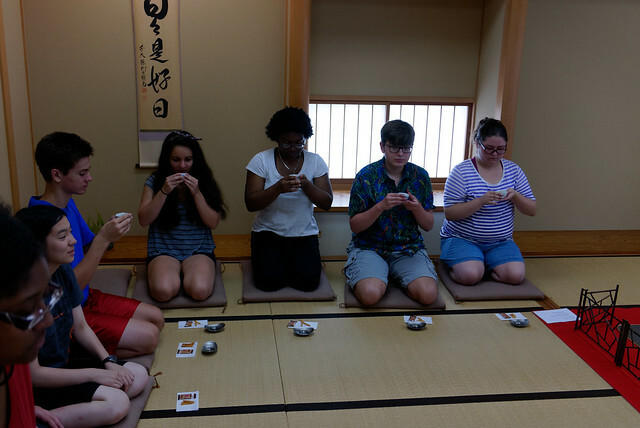 Students learned about the history behind and processes of the tea ceremony, all the while also finding out a little more about how the type of tea changes the tea ceremony. 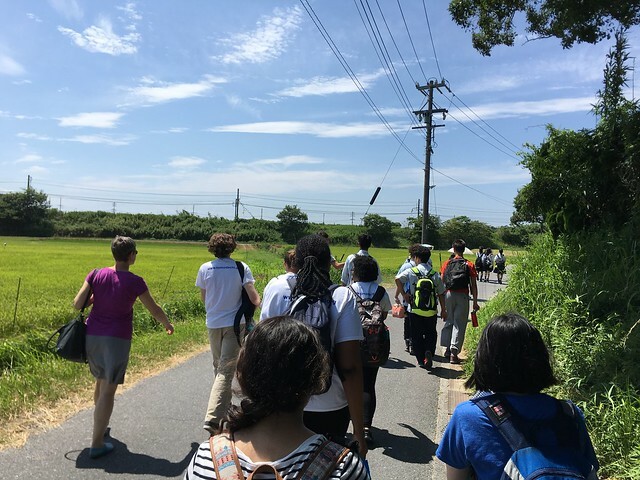 Several hours later, the group reconvened at the exit of the park, and everyone walked back to the Nihon Fukushi University Bunka Hall. After discussing tomorrow’s plan (including the concert order), the day’s activities were concluded, and everyone went their separate ways to rest in preparation for tomorrow’s festivities. 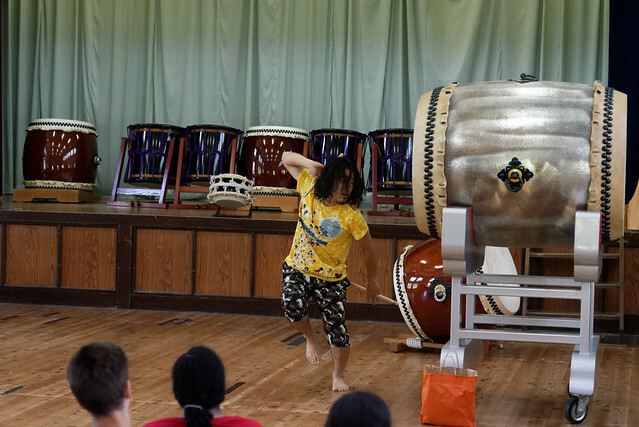 For more pictures from the day's activities, visit the Pittsburgh Taiko Flickr page. 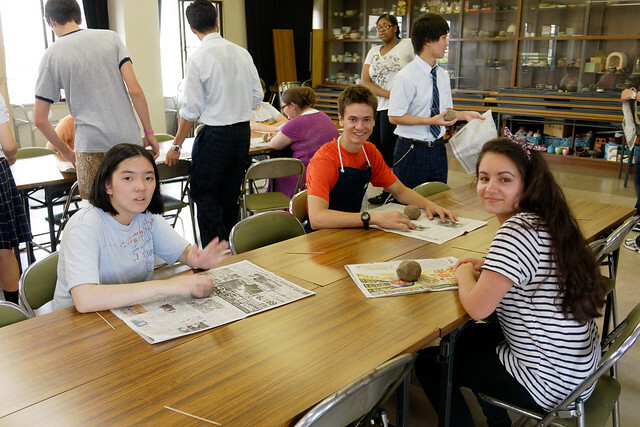 After a day away from Nihon Fukushi University, we returned today to the school’s Bunka Hall for morning practice. 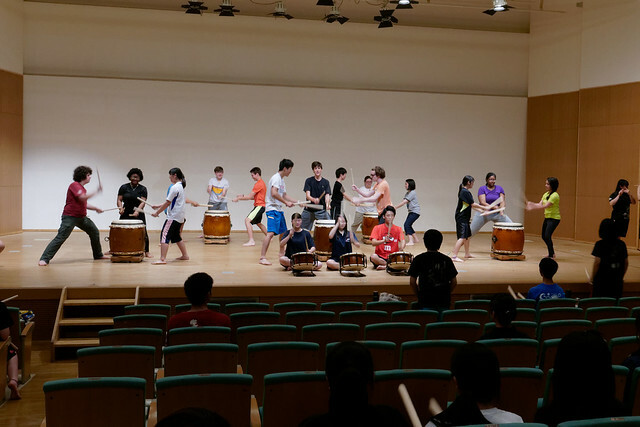 The students picked up where they left off, learning “Matsuri Daiko” from Rakko members. As it's one of the pieces they’ll be performing together during Saturday’s event (along with “Raku,” which they performed together last year in Pittsburgh), there isn’t much time to put everything together, but everyone is putting all they have into the practice, and so far the results are very promising! The bonds that the students have been been building during the week are showing both in the teaching/learning process and when they perform together. 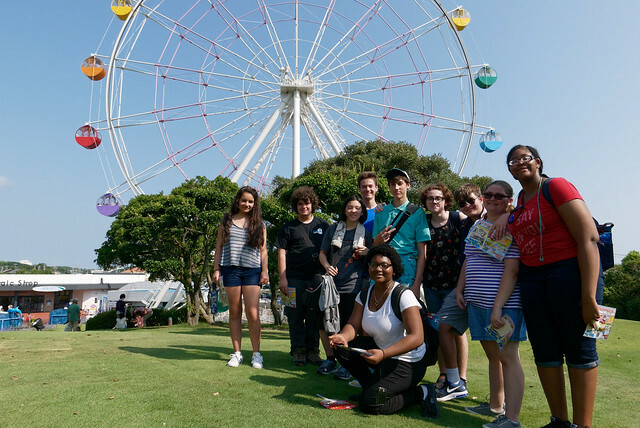 All students - from Pittsburgh and Mihama alike - seem more and more comfortable in each other’s presence, not just during practice time but during down time and as they travel together throughout the area. 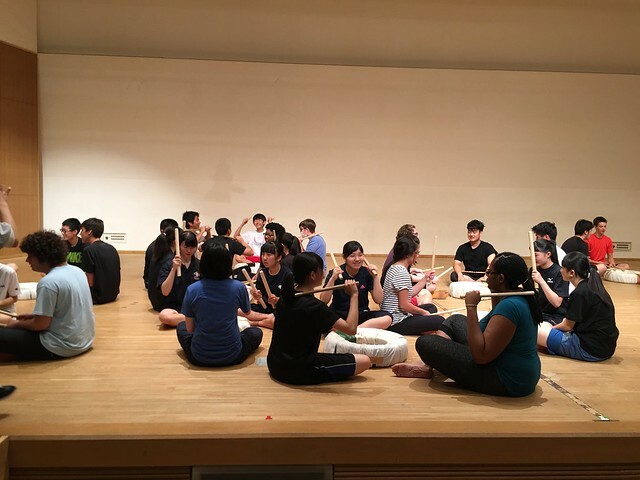 As the name of the program suggests, they truly are building Ties Through Taiko, ties that transcend musical performance and will allow them to establish deep relationships that are sure to continue after this week is over. 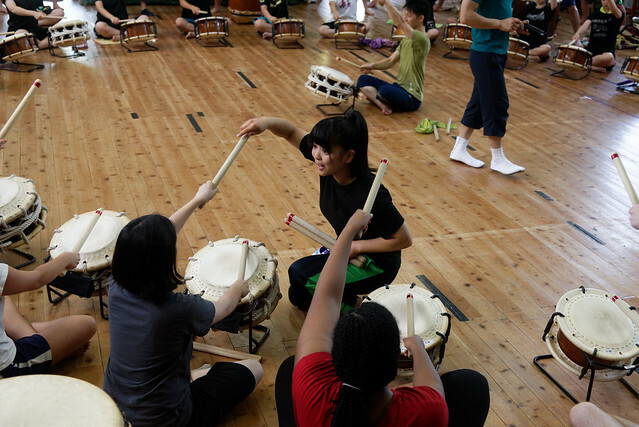 After successfully learning all of “Matsuri Daiko,” the Pittsburgh students took a seat while Rakko played a piece for them. Then, it was their time on stage, as they reviewed two of the pieces they’ll be performing on Saturday. They’re quickly getting used to not just the performance space but also the drums on which they will be performing - those in attendance on Saturday are in for a treat! 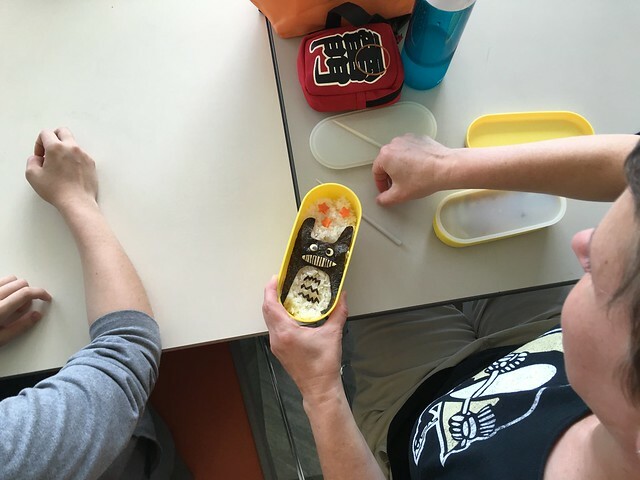 Practice was followed by lunch, with the students eating bento lunches made by their host families. 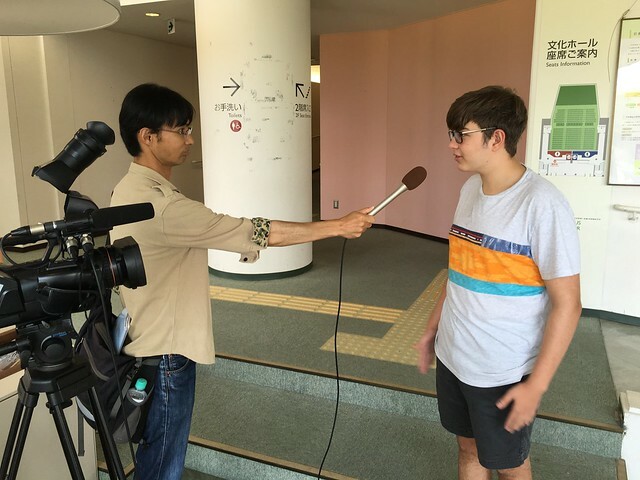 After lunch, Sabrina and Jacob A were interviewed by a local TV station about their experiences in Japan! 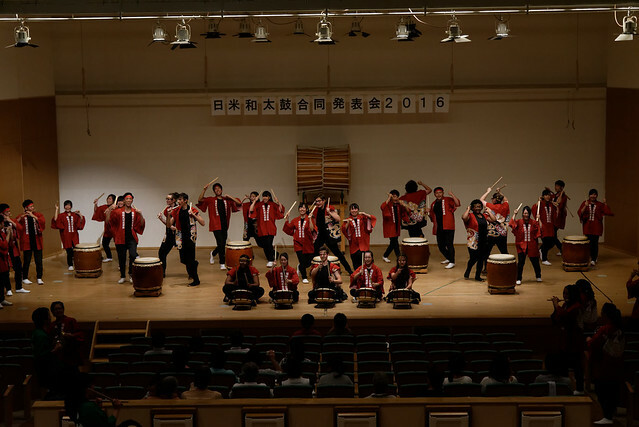 They spoke about playing taiko with members of Rakko, as well as explained why they wanted to play taiko in the first place. 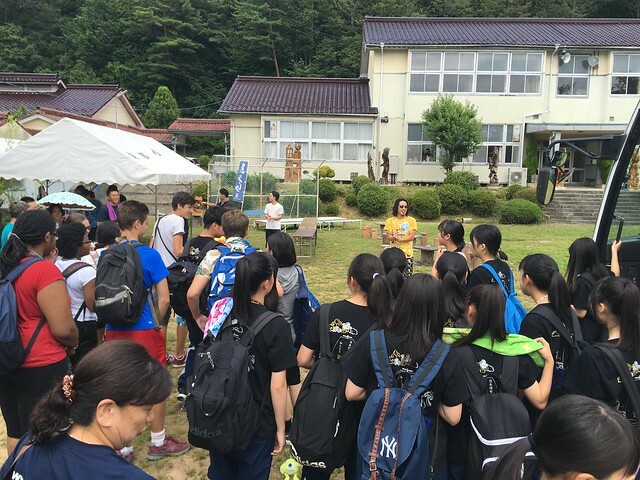 The group - Pittsburgh students and Rakko students together - then took a train to Tokoname, a nearby city famous for its pottery (the production of which has continued since the 12th century). 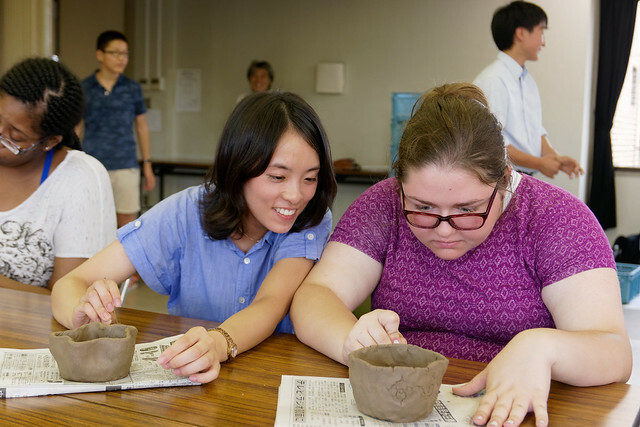 Students had a chance to make their own pottery, instructed by the father of one of Rakko’s members. We’re all looking forward to seeing how the final result turns out once the firing is complete! A brief walk through the surrounding area followed, before the group traveled to Aeon Mall Tokoname, where they had a chance to do some shopping before separating for the day. Just two more days until the performance, and three days left in the trip! For more pictures from today, check out the Flickr album! 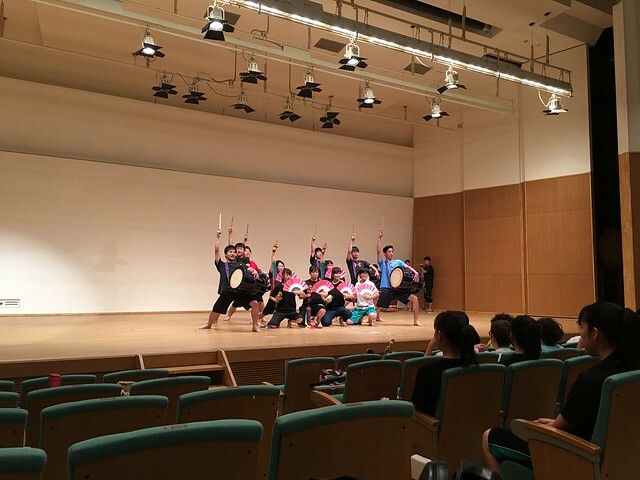 Today saw the group travel by bus to the mountains of Aichi Prefecture, where we went to the practice space of the professional taiko group Shidara. 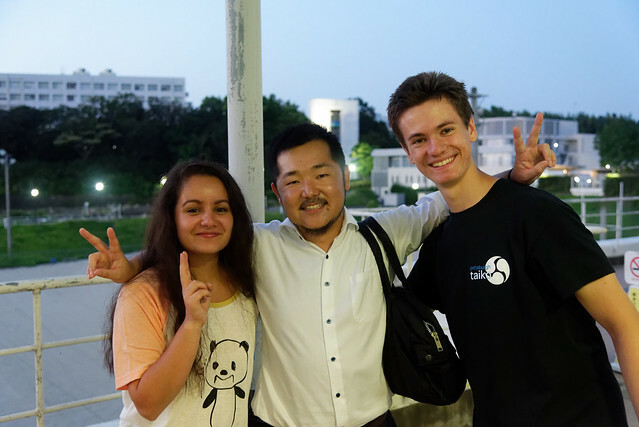 After a two-hour bus ride from the Nihon Fukushi University Mihama campus, we were greeted by Shidara members - including two current trainees who were with Rakko last year when they came to Pittsburgh! 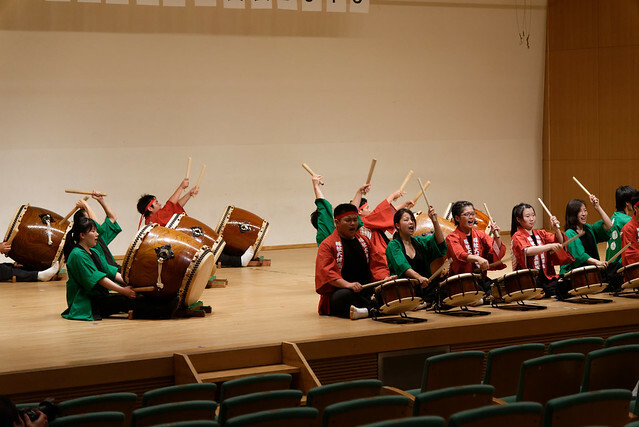 - along with surprise guest Takumi Kato, a professional taiko player, former member of Rakko, and longtime friend and supporter of Pittsburgh Taiko! Following the greeting came lunch. 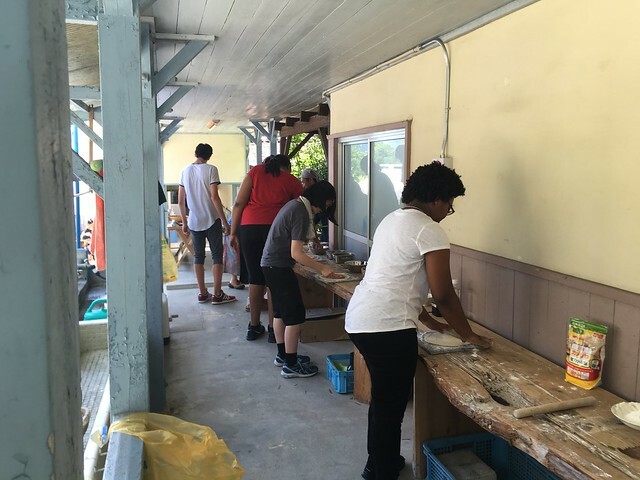 Shidara member made curry for all the students, but the Pittsburgh students were also able to make their own pizza and bake it in a stone furnace! Everyone successfully rolled their dough and added their toppings before having the resulting pizza baked, after which they could finally enjoy the fruits of their labor. 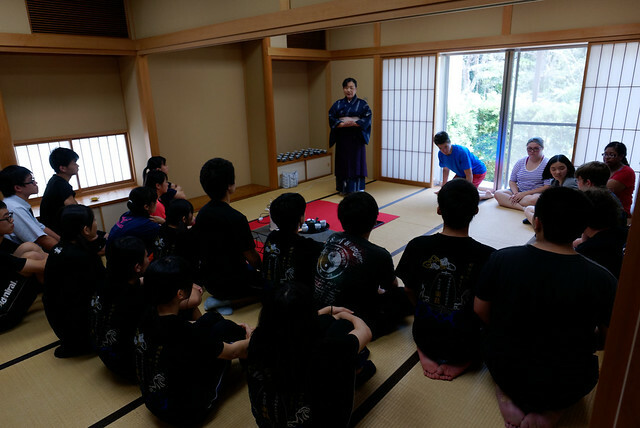 Lunch was followed by the main purpose of the trip - an afternoon of study with the members of Shidara. 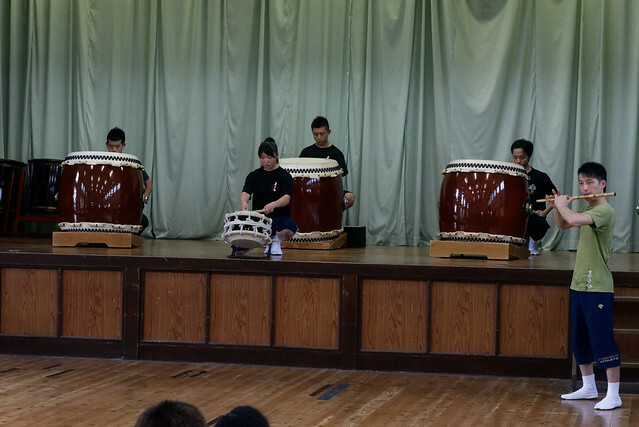 The afternoon opened with performances by both trainees and performing members of the group, as well as a performance of oni-daiko by Kato Takumi, before the Pittsburgh students took the stage to demonstrate their skills for the group. 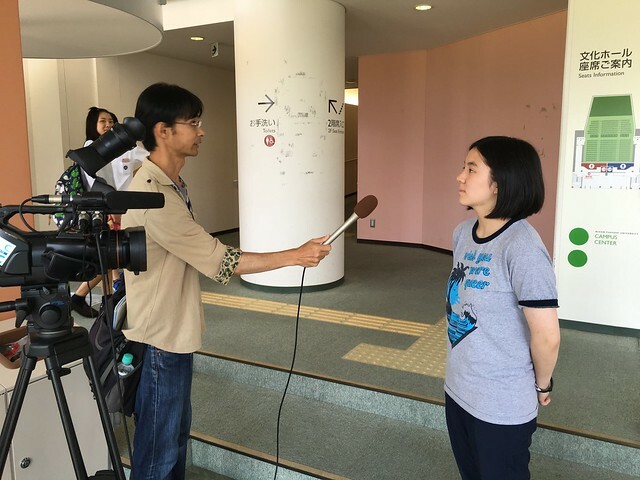 This was followed by brief comments by Shidara members and Kato Takumi, each of whom praised the students on their performance. 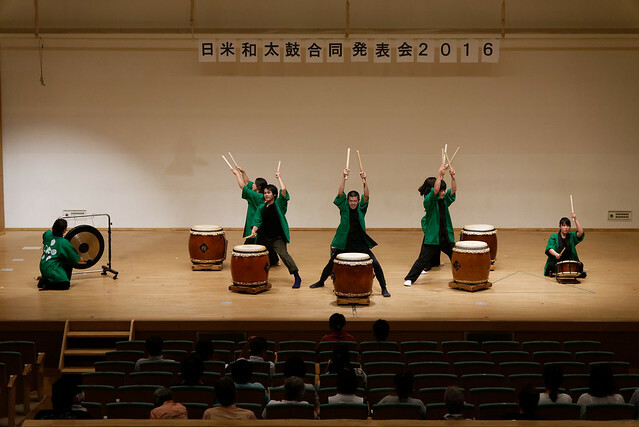 Members of Rakko then gave a brief performance, informing them of their successful 3rd place finish at the All Nippon High School Bunkasai. There exists a deep connection between with Shidara and Rakko, with several former Rakko members now performing with the professional group. After the demonstrations came the main event: an intensive workshop. The Pittsburgh students were introduced to the fundamentals of the Shidara performance style through a physically exhausting yet amazing session. 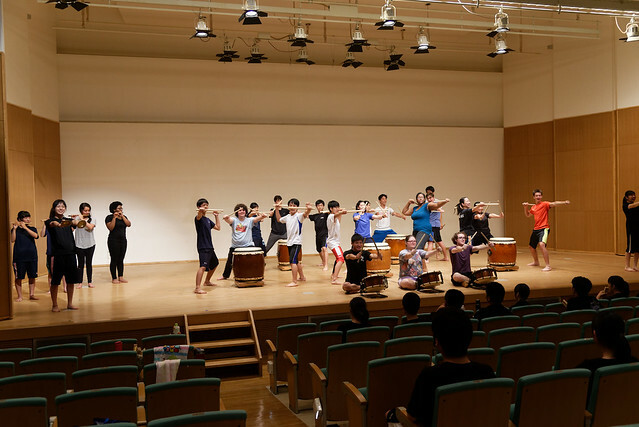 They started on shime-daiko, guided through the fundamentals by Shidara members. 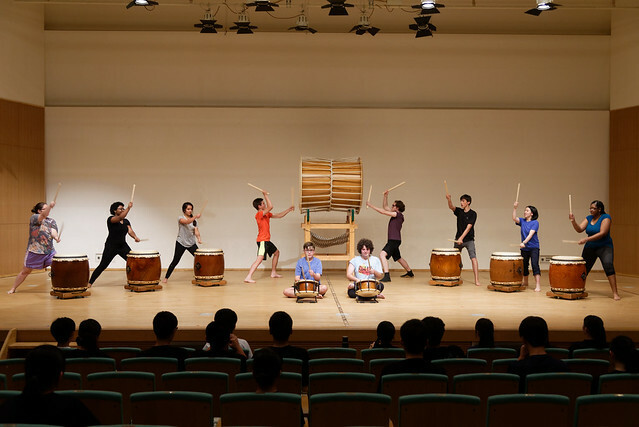 then, after a period of non-stop playing that tested their physical and mental limits, they took to the chū-daiko to apply the playing fundamentals to a different drum. Following the workshop, gifts were exchanged and group pictures were taken, keepsakes of an amazing afternoon. 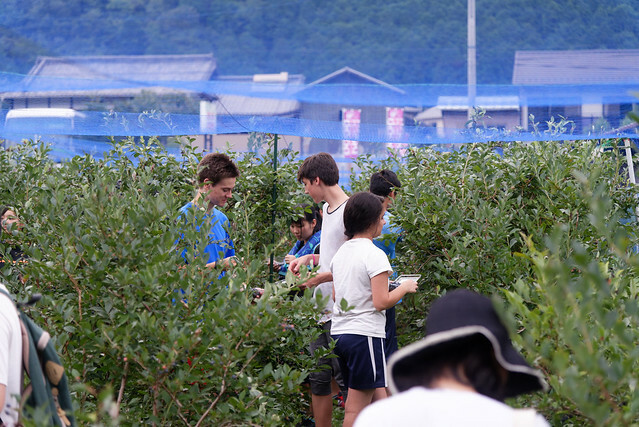 Everyone then got back on the bus and traveled a short distance to a blueberry field owned by Shidara, where they were able to pick blueberries to take back to their host families. Some time in the fields and a few goodbyes later, we were back on the bus for Mihama, where everyone separated for the day. 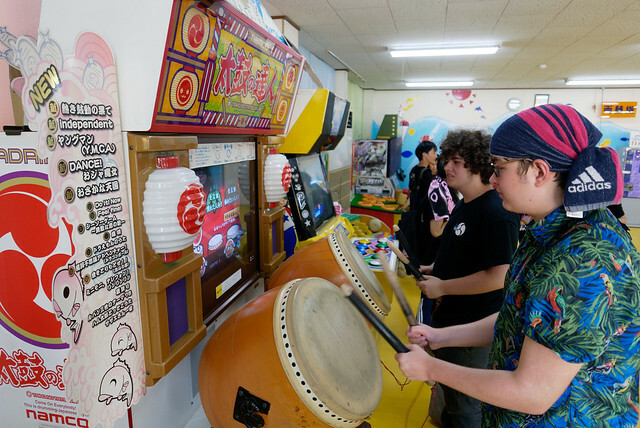 After a day of sightseeing around Mihama, plus a brief moment playing taiko by the sea, it was finally time for taiko practice! Plus, of course, a little more sightseeing, and a reception at the Aichi America-Japan Society. We began the day at Nihon Fukushi University Bunka Hall, where on Saturday the students will be giving a joint performance with Rakko. 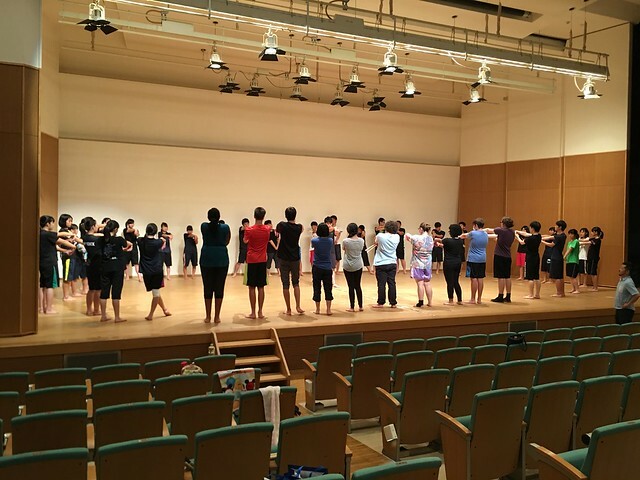 They began the morning's practice with group warm-ups, followed by a performance by Rakko of "Irodori." 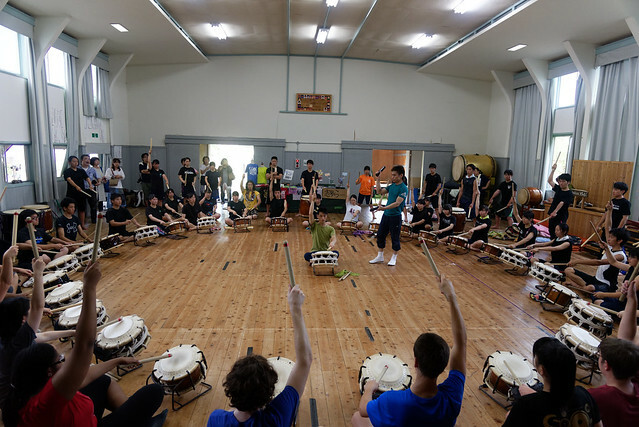 The Pittsburgh students then joined Rakko back on the stage, and the Rakko members began to teach "Matsuri Daiko," the piece that they'll be playing together on Saturday. Breaking up into groups of three, the students quickly picked up not just the rhythms, but also the vocals and the movements necessary for the song. 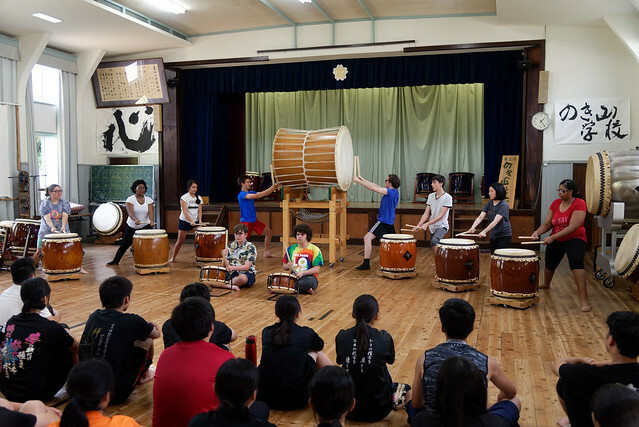 After learning the first part of "Matsuri Daiko," it was time for the TOMODACHI students to show off what they had learned since they first met Rakko one year ago. 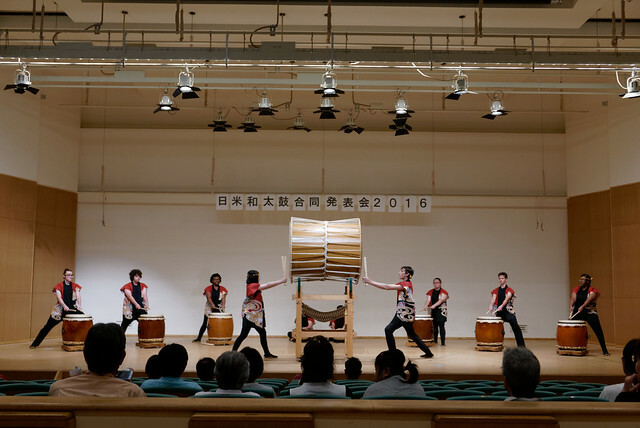 Upon request, they performed "Raku," the piece that Rakko members taught they last August. 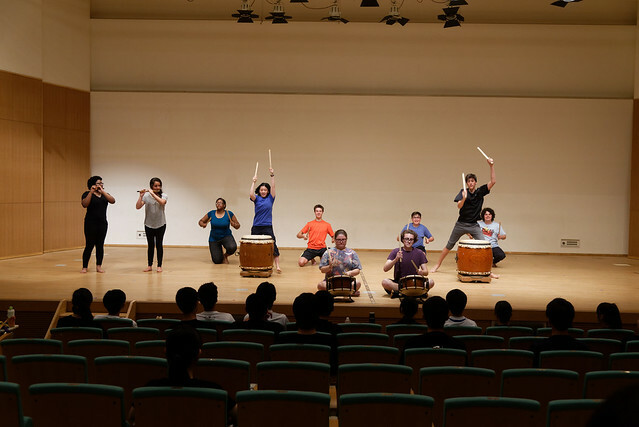 After this performance, Rakko members joined them on the stage, and a brief run-through of the piece demonstrated the energy and enthusiasm that the audience will be able to witness on Saturday. Then, the Pittsburgh students had a short time to run through and work on"Kore Kara," one of the pieces they'll be playing on Saturday (and had performed at the pre-tour concert at the end of July in Pittsburgh). It took a little while for them to get used to the unfamiliar drums and performance space, but in the end you could see their confidence returning and the energy finding its way back into the performance. 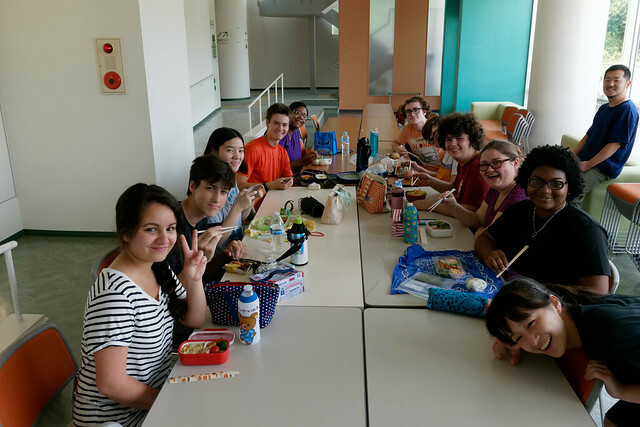 After a lunch break, during which the students ate bento provided by their host families, we departed for Nagoya! Two trains later, we found ourselves at the Nagoya City Science Museum, home to the largest planetariums in the world. Before the planetarium came some free time in the Science Center, checking out the various exhibits. 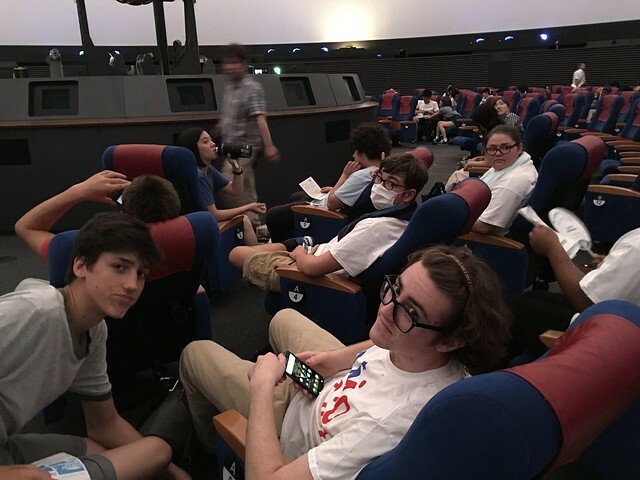 Once we entered into the planetarium, we were treated to a show about the constellations (with an emphasis on those stars and constellations important to the Japanese holiday Tanabata). From the Science Center, we went to a reception hosted by the Aichi America-Japan Society. After introducing themselves (in Japanese!) 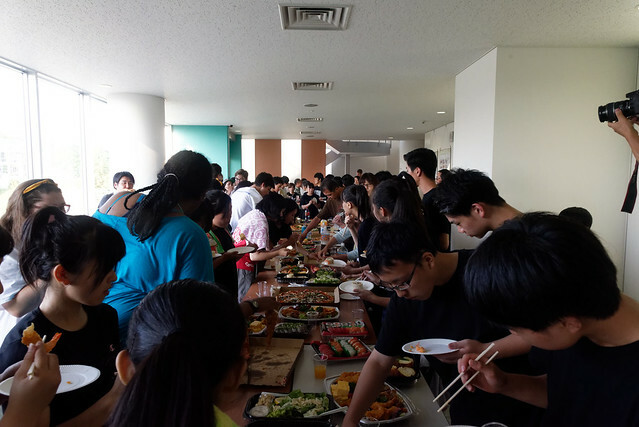 to those in attendance, the students were treated to dinner, all the while socializing with local businessmen and government officials, including a representative from the American Consulate in Nagoya. Ashley and Jacob S. each sang a brief song in celebration of the occasion, and their efforts were warmly received by not only the locals in attendance at the reception but their fellow students as well! 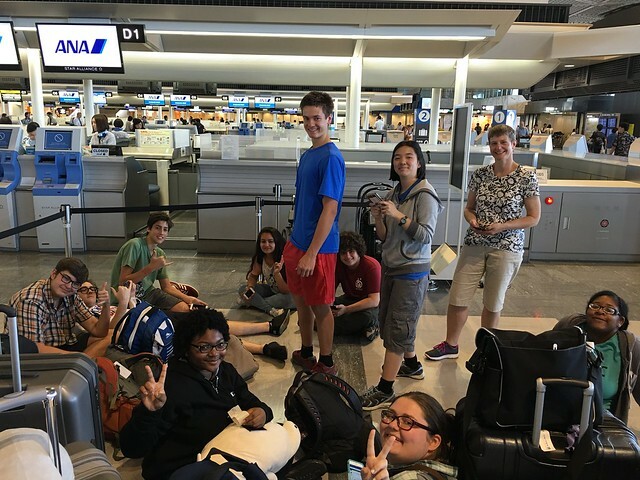 Following the reception, we boarded the trains and headed south, gradually parting ways to head back the host families and get a much deserved rest before tomorrow's trip to visit to the professional taiko group Shidara. Click here to see more pictures from August 9, 2016.